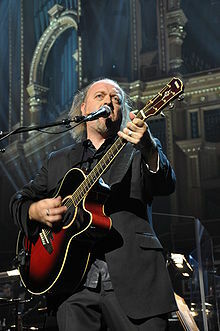 Bill Bailey (born Mark Bailey 13 January 1965, Bath, Somerset) is an English stand-up comedian, musician and actor. He often plays music in his comedy shows. Bailey is well known for being on television programmes like Bill Bailey's Birdwatching Bonanza, Have I Got News for You, Never Mind the Buzzcocks, QI and Black Books. In 2003, a newspaper called The Observer said that Bailey was "one of the 50 funniest acts in British comedy". In 2007 he was voted number seven on Channel 4's "Hundred Greatest Stand-ups". This page was last changed on 25 October 2018, at 09:58.